A new Emmy Noether Group in LMU’s Faculty of Veterinary Science is dedicated to understanding the mechanisms that underlie the operation of the immune system in chickens. A newly constituted Emmy Noether Junior Research Group at LMU will focus on the avian immune system, specifically that of the chicken. Led by Dr. Benjamin Schusser, the new group is based in the Department of Veterinary Science, and will employ genetically modified chickens as novel models for the study of lymphocyte development and function. Lymphocytes are the major players in the organization and implementation of adaptive immune responses in vertebrates. The project has received 1.2 million euros in grant funding from the Deutsche Forschungsgemeinschaft (DFG). Poultry supply more than one-third of the protein in the human diet worldwide. On the other hand, domesticated birds can also pass bacterial and viral pathogens such as Salmonella species and influenza viruses on to humans, often causing severe – and sometimes lethal – illness. 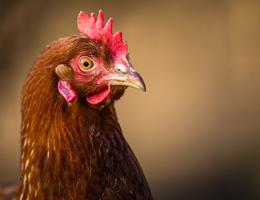 Better vaccines and more effective measures to prevent infection of the hosts themselves are therefore urgently needed – not least with a view to reducing the use of antibiotics on poultry farms. A better understanding of the avian immune system will therefore safeguard an important source of protein as well as protecting consumers. Benjamin Schusser has already made a major contribution to achieving this goal. In collaboration with colleagues at the University of California in Davis and the American biotechnology company Crystal Bioscience, Schusser succeeded in developing a method which, for the first time, made targeted gene knockouts possible in an avian species. “By inactivating a gene that is essential for the development of so-called B lymphocytes, we were able to create a model system for the study of the avian immune system. The modified strain provides a unique platform for the investigation of this cell type, which is a vital component of the immune system,” Schusser explains. B lymphocytes are the backbone of the humoral arm of the adaptive immune system, which plays a crucial role in the response towards infectious pathogens. Their task is to produce antibodies, soluble proteins which recognize and bind specifically to foreign invaders, and mark them as targets for elimination by other immune cells. Although they are found in all vertebrates, B lymphocytes were actually discovered in the chicken. Indeed, their name derives from the organ in which they differentiate, the so-called bursa of Fabricius, which is only found in birds.